I am honored to announce that this year’s recipient of IACA’s Rising Star Award in Hematology is Dr. Naval Daver. Dr. Naval Daver completed his fellowship and joined the UT M.D. Anderson Cancer Center’s Leukemia Department in 2011 as an Assistant Professor. His primary areas of interest are AML and MPNs. He is currently PI on 12 ongoing clinical trials (7 of these are investigator initiated studies) and Co-PI on >15 trials in the Department of Leukemia. These trials focus on developing a personalized therapy approach by targeting specific mutations or antigens expressed by patients with AML and myelofibrosis, identifying novel combinations of these targeted and novel cytotoxic agents, and overcoming mechanism of resistance. On a translational level, Dr. Daver’s research focuses on the resistance mechanisms that are at work in various therapies with the objective that they can tailor therapy for the individual patient and develop combination therapies to improve efficacy of single agents. Dr. Daver has published 97 peer-reviewed manuscripts, including 30 first author publications in the last 4.5 years mainly focusing on molecular and combination therapy strategies in AML and MPNs. The role of immune therapies including checkpoint therapies, vaccines, CAR-T cell therapies in AML remain poorly defined. Dr. Daver and his colleagues have developed one of the largest immunotherapy for hematologic malignancies programs in the country with 12 checkpoint inhibitor trials, DC vaccine trials, and is leading this program with Dr. Kantarjian in the Department of Leukemia at MDACC. Past recipients of IACA’s Rising Star Award in Hematology include Dr. Mrinal Patnaik and Dr. Nitin Jain. We hope you will join us this year to honor Dr. Naval Daver and take part in hearing his incredible story. Come join us at our Annual Dinner Meeting at ASCO 2017 to honor two deserving oncologist and take part in hearing their incredible stories. While you are at ASCO 2017, also come visit us at our Booth #5035 in the Exhibit Hall. 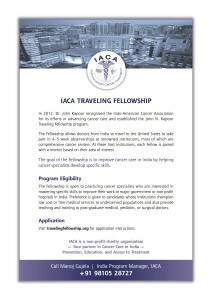 Applications for IACA Traveling Fellowship are being accepted through the Traveling Fellowship online portal. IACA’s Traveling Fellowship is dedicated to improving cancer care in the Indian subcontinent by training cancer specialists from the subcontinent at renowned institutions in the United States. The Fellowship is open to practicing cancer specialists who are interested in mastering specific skills to improve their work at major government or nonprofit hospitals in the Indian subcontinent. Candidates are selected based on their individual qualifications, recommendation letters from their home institution, and commitment to gaining valuable training for the purpose of practical utilization. Preference is given to candidates whose institutions champion low cost or free medical services to underserved populations and also provide teaching and training to postgraduate doctors. Please visit travelingfellowship.org for more information and to register. If you have additional questions, please email TF@iacaweb.org. 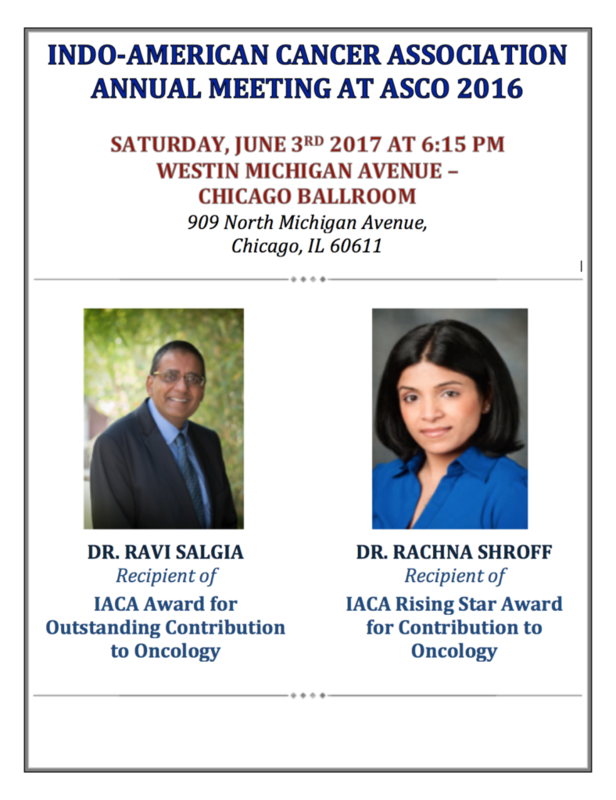 IACA is honored to announce this year’s recipient of IACA Award for Outstanding Contributions to Oncology is Dr. Ravi Salgia. Dr. Salgia is also the keynote speaker at the IACA annual meeting at ASCO 2017. 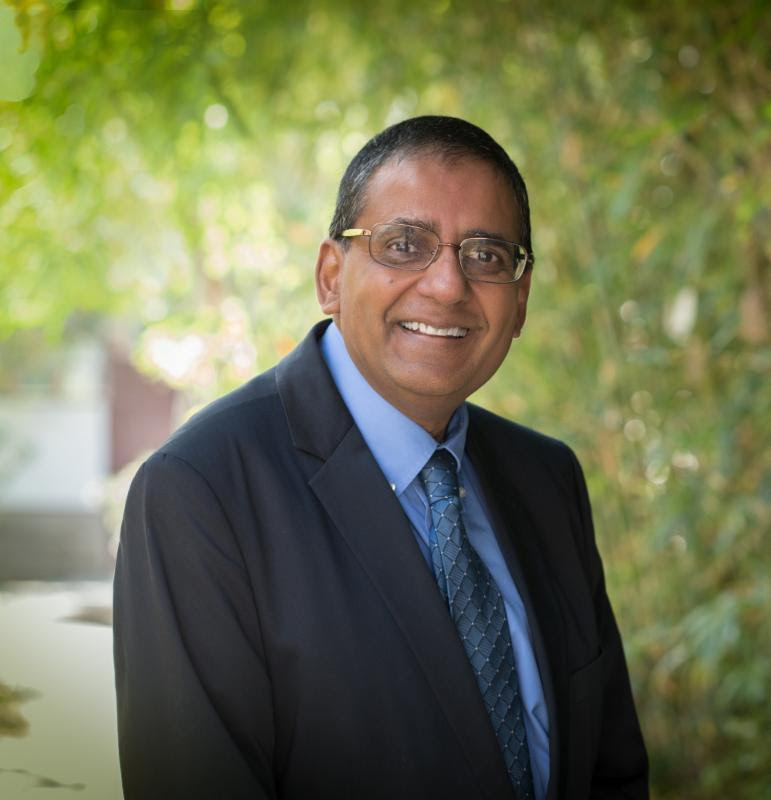 An esteemed physician and translational researcher, Ravi Salgia M.D., Ph.D., is the Arthur & Rosalie Kaplan Chair in Medical Oncology and Therapeutics Research at City of Hope, and the associate director for clinical sciences in City of Hope’s Comprehensive Cancer Center. Dr. Salgia has over 25 years of experience in translational research and the development of targeted therapies to improve the quality of life and survival of cancer patients, especially as related to small cell lung cancer. Dr.Salgia was the first to clone the focal adhesion protein paxillin and also localize the gene to 12q24. His laboratory also identified the gain-of-function mutations of paxillin in lung cancer. He went on to define receptor tyrosine kinases and have identified unique targets in lung cancer such as MET/RON and EPHB4 receptor tyrosine kinases. In fact his laboratory elucidated the exon 14 skipping of MET in small cell lung cancer and non-small cell lung cancer that has treatment implications in EGFR mutation lung cancer. His group have also developed a large bioinformatics database for thoracic oncology. He has authored over 330 peer-reviewed articles, reviews and editorials, one book, and 34 book chapters, and has been awarded several NIH grants for his research, as well as several invention discoveries and patents related to his work. He is the current Chief Editor for Cancer Commons, and Associate Editor for a number of journals. 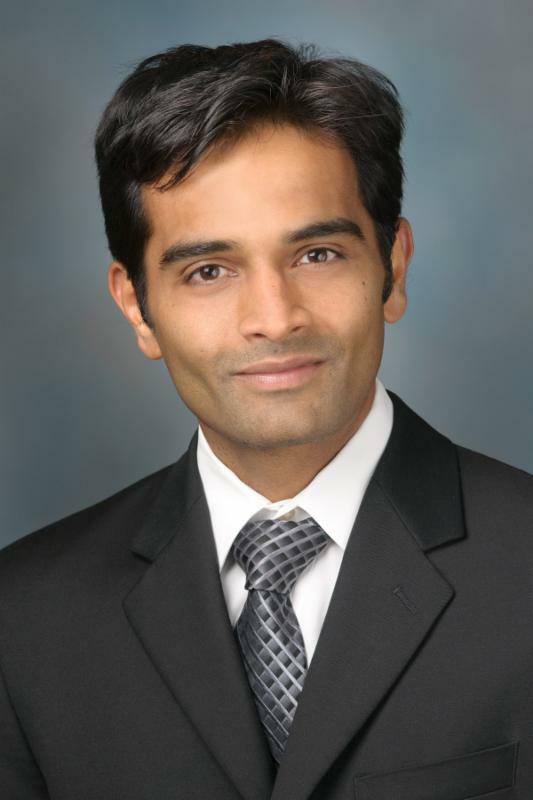 He is internationally known for his scientific accomplishments, and serves as a chartered member of NIH/NCI’s Clinical Oncology Study Section, was elected as the Translational Science Representative on the Thoracic Malignancy Steering Committee of the NCI, and previously served on the NIH Tumor Progression and Metastasis Study Section. At the City of Hope he has developed a large informatics database in thoracic malignancies that is available on the iBridge network. Prior to joining City of Hope, Dr. Salgia served as tenured professor of medicine, pathology and dermatology; director of the Thoracic Oncology Program and the Aerodigestive Tract Program Translational Research Lab in the section of hematology/oncology; and vice chair for translational research in the department of medicine at the University of Chicago. He was also associate director for translational science at the University of Chicago Comprehensive Cancer Center in Chicago. Past recipients of this Outstanding Award in Oncology have included Dr. Manjit Singh Bains, Dr. Jatin Shah, Dr. Mansukh Wani, and Dr. Rengaswamy Sankaranarayanan. We hope you join us this year to honor another deserving oncologist and take part in hearing his incredible story. IACA is a 501(c)(3) organization that supports programs of highest quality in cancer care,education,mentoring and prevention.IACA is a registered public charity and all contributions are tax-deductible to the extent allowed by law.IACA Federal EIN is 22-3945213. 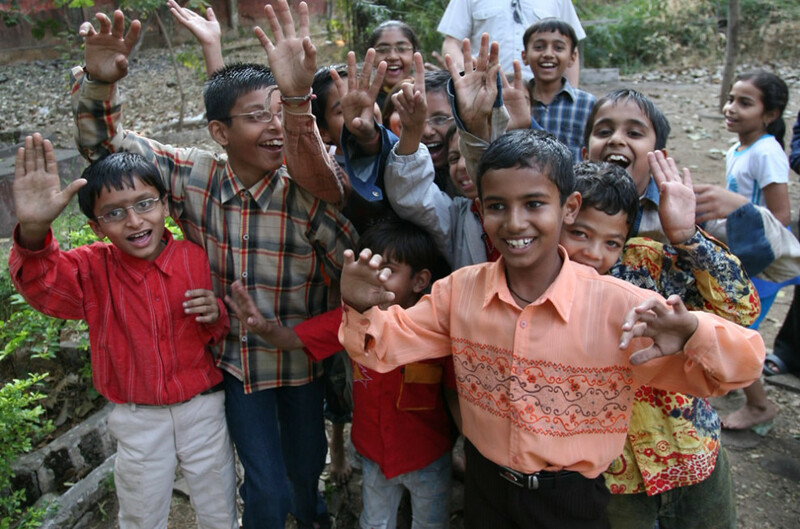 Every dollar you donate will facilitate the various IACA projects and help train fellows in palliative care or develop expertise in areas of unmet need and fund the entire care of kids with cancer. All contributions are tax deductible, the fullest extent as allowed by IRS.